Grand Trunk Western #6039, assisted by NKP #514, moves from the Steamtown turntable to the Roundhouse. Electric City has one of the longest and most interesting demonstration streetcar lines in the U.S. Watch as the museum’s Red Arrow Center Entrance Car #76 makes the trip from Montage to Scranton. The final clips show #76 being tucked in for the night at the Montage carhouse. Annual conventions not included, the Pennsylvania Weekend is the ERA’s first two-day trip since the Baltimore Weekend in 2011 and we expect it to be one to remember. We will visit the Strasburg Rail Road, the Railroad Museum of Pennsylvania, the Steamtown National Historic Site and the Electric City Trolley Museum. We will leave NYC at 8:00 AM from the east side of 8th Avenue, just south of West 41st Street, across the street from the Port Authority Bus Terminal. From there, we will begin our fun with a visit to the Strasburg Rail Road in time for a quick lunch followed by a 45-minute train ride through Amish Country. We will then visit the Railroad Museum of Pennsylvania in Strasburg. 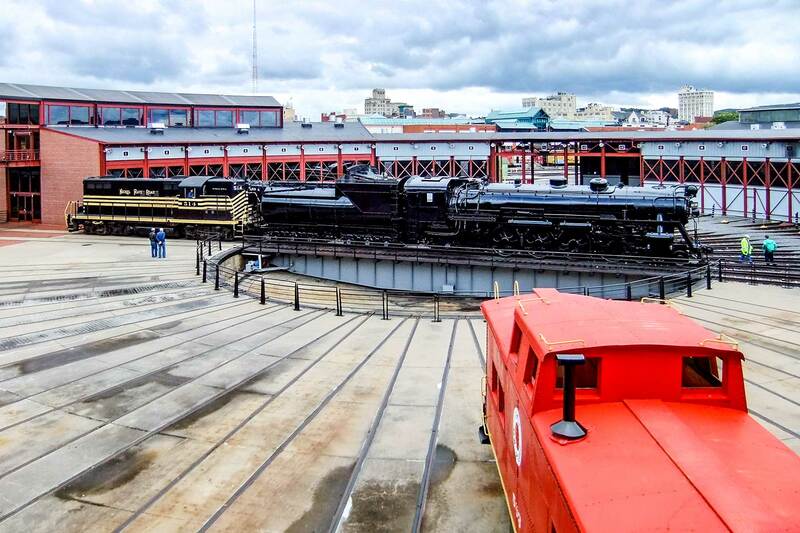 This museum covers more than 18 acres and houses over 100 historic locomotives and railroad cars that chronicle American railroad history — the core of their collection was originally part of the Pennsylvania Railroad’s 1939 World’s Fair exhibit. We conclude our day with an all-you-can-eat Pennsylvania Dutch buffet at Shady Maple in Lancaster and a stay at the Quality Inn in Wilks-Barre, including a free hot breakfast the next morning. Our next day begins at 8:30 AM with a short trip to the Electric City Trolley Museum in Scranton and a long ride in a former Red Arrow streetcar/interurban from the museum to the Scranton Baseball Park. Following time for lunch in Scranton we will visit the Steamtown National Historic Site, a railroad museum and heritage railroad in Scranton, Pennsylvania, located on the former yards of the Delaware, Lackawanna and Western Railroad. Their museum features original DL&W buildings, steam locomotives and other equipment and has been continually expanded since their origins as a private collection. We expect to be back in New York City before 7:00 PM so that there will be no need for a dinner stop on the way. The Pennsylvania Weekend is only $195 per person, double occupancy; for single occupancy the price is $260 per person. That includes bus fare to and from New York City, admission to all four museums, the all-you-can-eat buffet dinner at the Shady Maple and an overnight stay at the Quality Inn that includes Sunday breakfast. Please book your tickets ASAP! This is a trip that is not to be missed and it will sell out fast. All orders must be in by October 8 in order to hold the room space. For further information, please contact Robert Colorafi.